Historic. A first. Football fever. Loud. Unprecedented. Call it whatever term you want but this fact is obvious: Today — Nov. 15, 2012 — will change football in Cebu. Last June — just five months ago — over dinner at the famed Marco Polo Hotel, a group of passionate footballers talked about holding an international meet here. Ricky Dakay and Dan Palami, together with the Cebu Football Association (CFA) officers, sat in a large table with Mike Limpag. Is Cebu ready? Will the Cebu City Sports Center venue be in decent shape? Can the grass grow on time? Can we organize this gargantuan task in just a few months’ time? The answers? Yes, yes, yes, yes. So, yes, here we arrive today. As a sports lover, I’ve never seen such buzz. 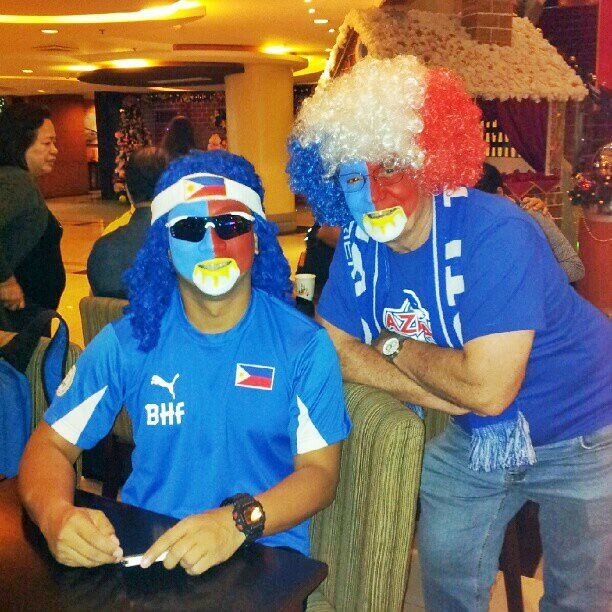 For tonight’s Philippine Azkals versus Singapore Lions football game isn’t just for football fans. It’s not just soccer dads like Ariel Uy and Harry Radaza or for coaches like Joshua Fegidero and Dennis Peñalosa or for CFA officials like Glenn Quisido or Mike Veloso. Tonight is for all fans. Sports fans. Fans who like gazing at players with movie star good looks. Cebu fans. In fact, most of the spectators tonight will be witnessing — myself included — such a large-crowd football event for the first time. Imagine over 7,000 screaming fans? PRESS CON. I attended yesterday’s “face off” between the two head coaches, led by our own, Michael Weiss. Also in attendance were captain Chieffy Caligdong and three Cebuanos, Paolo Pascual, Ray Jonnson and Patrick Reichelt. The impact of this event is huge. “The positive impact has began,” said Mike Limpag. “Even days before the friendly, when somebody posted a picture of the CCSC field.. the photo went viral… some were asking if the CCSC field uses artificial grass. Nimrod added that several items are not allowed inside the CCSC today: Water bottles, sharp objects, lighters, matches, umbrellas, and laser pointers. RICKY DAKAY. The man who deserves the loudest applause is Engr. Pericles Dakay (you can also call him “Doctor” as he finished a Doctorate in Engineering in the US). Ricky is a Rotarian, a family man, a civic leader, a businessman (head of the Dakay Construction), but his most important role today is as president of the CFA. All thanks to Ricky. If not for him and the new CFA Board — and that dinner talk last June — we’d be at home early tonight watching ESPN.